Delta Force Paintball is the ideal location for your next birthday party. Whether you bring a few friends or bring them all, or how young* or old the birthday person is, we’re sure your party will be the highlight of the year. In our 20+ years of operation we’ve seen thousands of fun and exciting paintball birthday parties come through our doors. For the ultimate birthday party, feel free to bring along a cake and celebrate in style in our base camp. With covered seating picnic tables and beautiful surroundings, you can set up and enjoy a memorable day out. Even if you are not joining them in battle you are more than welcome to relax in our base camp. When it comes to safety no other centre compares to the standards of Delta Force. We have a 100% safety record and you can rest assured that all Delta Force players will receive the celebrity treatment. From the very best and safest equipment to strictly enforcing our safety policies, all players will return from battle in one piece (if not a little bit muddy). Delta Force is the industry leader in Australian paintball, and our safety practices, procedures and equipment are correspondingly high. When you arrive at the paintball centre be sure to point out who the birthday person is to our highly experienced staff. This will ensure they receive some ‘special treatment’ throughout the day, and might even be the lucky recipient of the President’s fluorescent jacket to guarantee they stand out from the pack. So contact us today and get ready for a memorable Delta Force Paintball birthday party! 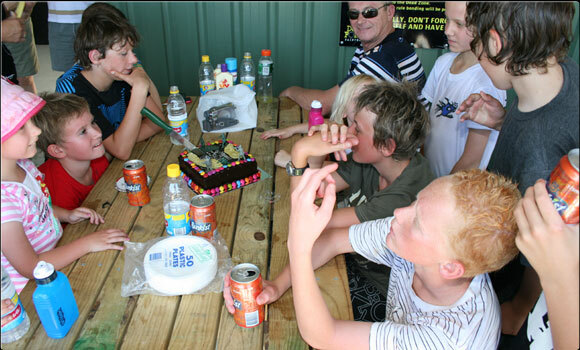 *Please keep in mind that the current minimum age to play paintball in Perth is 12 years old.